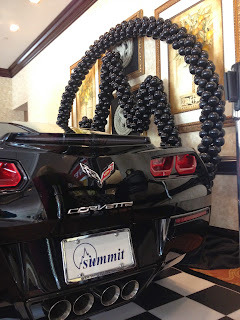 Party People Celebration Company was hired to created a logo inspired design to be part of Summit Consulting's display at Gaylord Palms Convention center for Corvette Giveaway, 1,000 5 inch balloons on framework created the logo. fun angle of the logo from the back of the car. Full Display! Call Party People Celebration Company to have us create your Logo for your special display or event 863-255-2025 email partypeoplecc@msn.com website partypeoplecelebrationco.com Party People celebration company is located in Lakeland Florida and delivers throughout Central Florida.